Oregon National Historic Trail in Baker City, Oregon. The Oregon Trail was used by traders, mountain men and fur trappers beginning in the early 1800s. It was originally an Indian route, to be traveled on foot or horseback only. By the 1840s the route had been widened and covered wagon trains were making the 2,000-mile journey west. Settlers and traders set out from Independence, Missouri into Nebraska, Wyoming, and Idaho, arriving at the Columbia River in Oregon, where they faced delays at The Dalles due to impassable rapids. Wagons were floated down a dangerous section of the Columbia River while livestock was led over the mountains on foot, through the rugged Cascades. By 1846, the completion of the Barlow Road gave wagon parties another option to arrive at their final destination, Oregon’s huge fertile Willamette Valley. 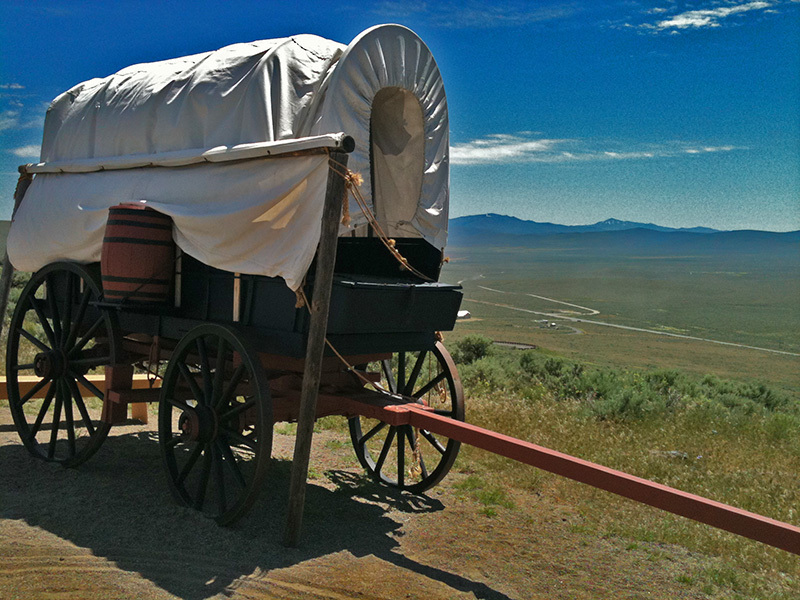 After word had gotten out about opportunities in the West, the Oregon Trail was used by over half a million people. Wagon trains came to a halt in 1869, after the completion of the Transcontinental Railroad. The journey by rail took about a week and cost much less than travel by wagon, which took as long as six months and cost hundreds of dollars and human lives.